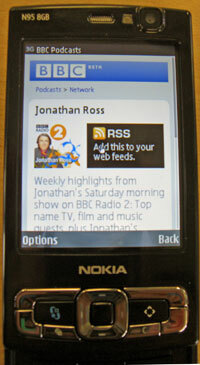 The BBC continues to ramp up its mobile efforts with targeted versions of its podcast directory for Sony’s PlayStation Portable (link) and Nokia’s flagship N95 handset (link), along with a new generic offering designed to work on most Internet-capable cell phones. Specific to each device’s screen size and other technical specifications, the mobile versions enable users to stream rather than download any of the BBC’s podcasts, which can be browsed by radio station, genre or alphabetically. A similar version for Apple’s iPhone and iPod Touch was launched last November. Our excellent mobile teams here at the BBC gave us stats on device takeup, and we matched these with the user-agents our server sees downloading podcasts. The top device classes were the N95 and the PSP — the latter of which accounted for a staggering 5% of all podcast downloads. Others notable devices were the Windows Mobile and Blackberry device classes. Moving forward, Cross says the BBC plans to offer more personalization by enabling users to create their own feeds based on tags, genres, presenters and contributors, along with integrating podcasts with rest of the BBC’s content database. Nokia N95 was awarded as the best set of the year and no doubt one can easily understand why BBC padcast has selected this device.